The other night we went out with 30 of our friends to a new restaurant and bar in our neighborhood for my birthday. My wife and I ate there a few days earlier and agreed it would work well for our crowd. Who knew one can make so many friends in two and half years of moving here but we did! While we don't always get together regularly, we do get together for drinks or late night food between 2 and 4 times a month in smaller groups and maybe once a month in a bigger way for a party or birthday. Because this blog post is a lesson that any business can live or die by its management and staff. Along the way see how sales, social media, personalities, business expectations, training, psychology, and in my case, ignorance all come into play. As we all arrived at the restaurant, we had made a reservation for 18, then changed it to 25 and the restaurant had made space in their back room for us which we proceeded to fill. The locals and friends from neighboring cities proceeded to order drinks and food or desserts. The people at our table ordered first and most of us got our food and drinks in a reasonable time. But, a specific dish with 4 of us had ordered, seemed to not be coming. While I did not mind, some of the more hungry guests were not amused and asked when we would get our food. We learned that there was only one appliance to use to make this particular meal and it would take some time as now there were 8 total orders of the same item. It did not help that the other waitresses grabbed whatever was ready and delivered it to their tables without realizing or noticing the early ones should have gone to us. Again, not the biggest deal to me. It seems at some point some people had words with the hostess who explained that the restaurant was not prepared for such a large group. For a place that has existed for a few years and has an ample seating space outside and inside to accommodate at least 100-125 people, this was an unexpected answer. I did not find this out until later that night or the next day. All our food arrived but not before two people left to go get burgers down the road after letting the waitress know they were not waiting any longer. I also didn't know this at the time but found out later. Thus about 2 hours later as the party was ending and people started to pay their bills, I went to go pay for ours as well. I let the waitress know what my wife and I ordered and paid the bill and thinking we were the last ones we should head home. There was an amount due. Okay, I figured some people drank shots or maybe didn't realize their spouses did, so I figured, my party, I can cover it, right? It turns out we were short about 600 shekels or roughly $150! Now I know my friends here and trust them to be both honest and full of integrity, even when drinking, so I asked to see the full bill receipt. I then sat down to go over everything listed and asked them to verify the payments received. It was at this moment that I must claim ignorance. I was not involved in the other conversation that started between my wife, or the few friends still lingering and the hostess/waitress. 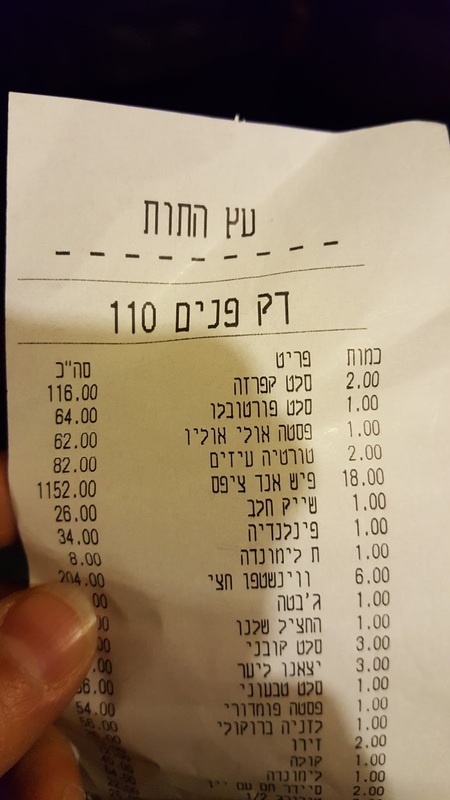 It seems that the choice of words, this is all in Hebrew, was accusatory and rather indignant that our friends skipped off without paying. No, it could not be the restaurant's error, everything is on the computer and what were we trying to pull. Reminding any of you of client meetings over billing hours yet? I eventually found out that the meal, I and 7 others ordered, had been entered into the computer as 18, not 8, orders! Simple math 10 x 60 = 600. The actual numbers came out and showed that my drinks were paid for by my friends, which is usually how we all do it for birthdays so I, in essence, received a small amount of money in a refund. Thanks everyone! The management, hostess, and waitress provided no explanation nor any apology. Culturally I understand this and it didn't bother me at the time, again, because all I knew was I found the error, they fixed it and all was good. My friends, a mixed group of Americans and Israelis were not very happy with the entire situation. They wanted to post bad Yelp reviews, wanted to tell our whole community about the way we were treated, and do what people do most with social media, gripe. Before you say, "but you are doing just that", my hope is that the owner will see this, but also to parallel it with our own business situations. 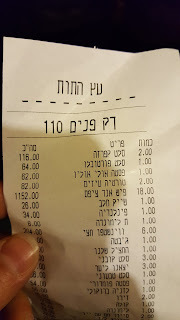 Our bill which was about 3,000 shekels or about $750 got me thinking about the business side of this situation and what everyone can learn from it. Yes some of it is obvious, but as a case study in hospitality management, here we go. My friends go out quite a bit as I said, many of us either run our own business or, at our age, are high-level sales people or managers. We have money to spend when we want to go out. Some of us have small invitation events for artists or non profit benefits during the year that we need a nice, and new, place to invite people. And as a business lunch option, this could work too. Doing some back of a napkin math, with the number of restaurants extrapolated and annual sales defined from here and here says the average restaurant makes 700,000 shekels a year. I don't think it is a stretch to say that if we all liked it and told other friends our combined spend reaches 75-100,000 shekels a year. 10% of their revenue to me sounds like a big deal based on what I read. Similarly we have no idea who is at a table or in an audience, on the train or randomly walking by us when we are unhappy about a situation at work or with a client. It may cost us our jobs or our bonuses or future jobs at the time. This is a tough thing to overcome because trust once lost is very hard to regain, especially in this case where we would have no other interaction with the establishment. The restaurant could have filled a void for us that we need in our community, a kosher bar and restaurant, and had high hopes for it but it seems they do not share our hopes or have any interest in filling our needs. By not engaging with the clients in a reasonable fashion and laying blame on them, you can see how service contracts go bad in businesses so easily when vendors take a one sided view. This one sided view is "taught" to the staff because they will naturally be influenced and then follow their leader. My friends, like you reading this out there, have various expectations about dining out. Some want value for their money, others want high end cuisine, some expect the staff to be as professional as business people (hard to ask from teenagers or even college age people), others are okay with waiting if they have were warned about delays or like me not bothered about it all. The Snickers commercials in the US hit the spot on this one from both sides of this discussion because maybe it was all just late at night and everyone was hungry. When your focus is on the wrong information, attitude or goals, your business can not survive because you send your staff down rabbit holes that have no way out. It may also help to deliver the goods or services on time and feed your staff and customers within reasonable times.